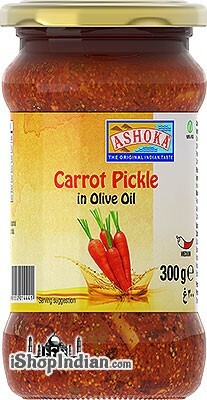 This Olive Oil Carrot pickle is comprised of carrots, olive oil, salt, mustard, chili powder, fenugreek and other spices. A spicy pickle tomato preparation that is commonly mixed with cooked rice in South India as a unique and authentic spiced rice dish. 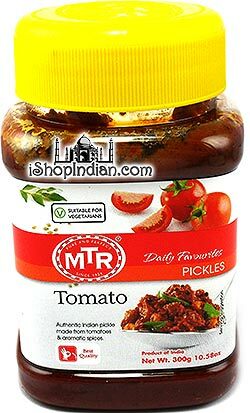 Ingredients: Tomato Pieces, Sesame Oil, Salt, Chilli Powder, Fenugreek Powder, Mustard seeds, Chillies, Turmeric Powder, Asafoetida. 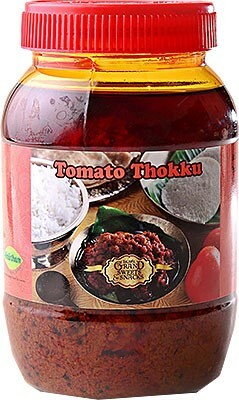 Add a proportionate measure of Tomato Thokku Mix to the Boiled Rice and mix well. Best relished with Idli, Dosa, Chapathi, Puri etc. Allergy Advice: Made in facility that processes Peanuts, Tree nuts, Soy, Milk, Wheat and Sesame. 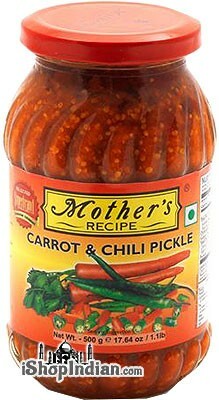 Juicy chunks of carrot and crisp green chillies lend their individual flavors to this exotic mix. Indeed a gourmet delight. Ingredients: Carrot pieces (43%), Raw mango pulp, Salt, Cottonseed oil, Water, Spices (Chilli, Mustard, Fenugreek, Turmeric, Cumin, Coriander, Asafoetida), Green chilli pieces (6%) and Acetic acid as Acidity regulator (E 260). Allergen Information – This product contains mustard. A unique member of the ginger family with a delicate green flavor. 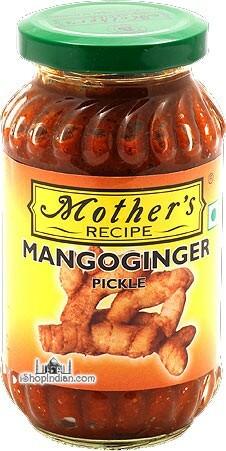 It is spruced up to give the most scintillating, tempting, tongue teasing Mother’s Recipe pickle ever. 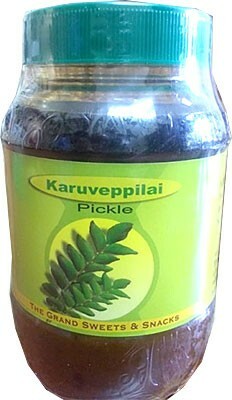 A popular South Indian pickle made with tomato, salt, sesame oil, tamarind, red chili, mustard, urad dal, garlic, cumin, chick pea, turmeric, asafoetida and acetic acid. 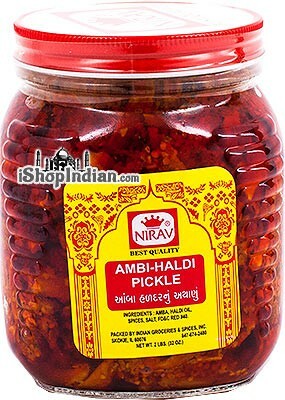 A regional delicacy of India, Amba Haldi Pickle is made from fresh turmeric pieces and mixed with succulent spices. Ingredients: Amba (Turmeric/Haldi), Haldi oil, Mustard, Spices, Salt, and FD&C Red #40. Gunda are similar to olives, and have a similar taste. When mixed with hot spices, they have a tart and pungent flavor. 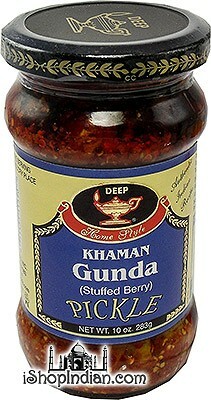 This pickle is whole gunda with pits. 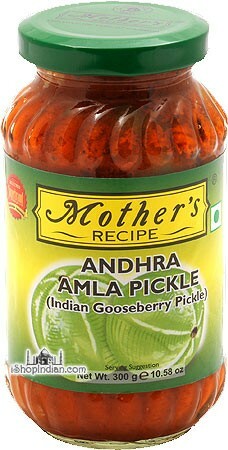 A pickle made from a sweet and tart green gooseberry, similar to amla. 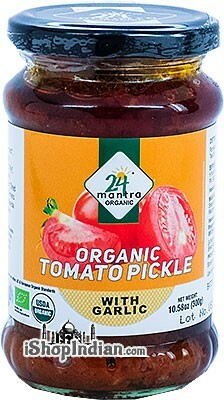 Its spicy and tangy flavor is derived from the spice infused oil. Pickle made from ground eggplant and spiced with garlic, ginger and spices. 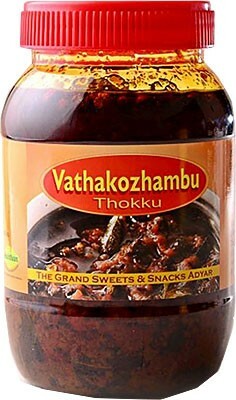 Enjoyed with rice and pappadums. Also known as Pataks Brinjal (eggplant) Relish (sweet & spicy) Medium. Indian bittermelons (karela) pickled in spices and oil. 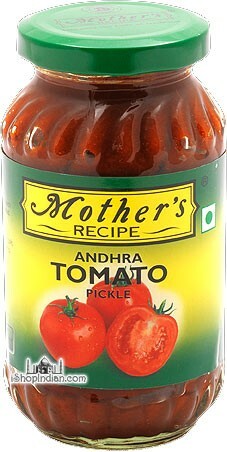 A South Indian specialty condiment.